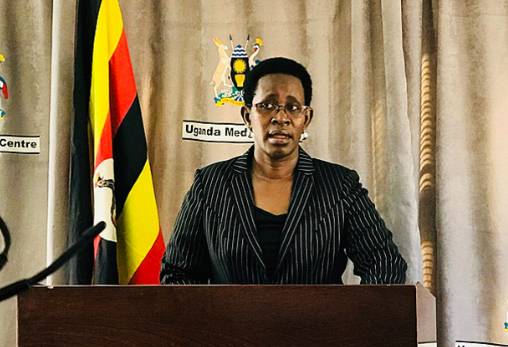 KAMPALA – The Permanent Secretary in the Ministry of Health, Dr. Diana Atwiine has warned that if antimicrobial resistance is not seriously addressed several lives are at stake. She made the remarks during the media breakfast on Antimicrobial Resistance at the Ministry’s headquarters today (Monday ) in Wandegeya. Dr. Atwiine said that failure to complete given doses, self-medication, taking antibiotics without proper prescription are some of the factors leading to resistance. She appealed to the National Drug Authority to continue with the measure of no giving antibiotics without a prescription from a health worker because people are accessing these drugs off the counter and yet hurting their health. “If you have been taking drugs and feel that you are not improving, go back to the lab so that you are tested again to verify the real problem because it could be an infection but don’t do self-medication,” Atwiine urged. Director General of Health Services, Dr. Henry Mwebesa called on the public on buying over counter drugs, adding that the ministry is in discussion with the National Drug Authority on how to combat the off counter drugs. Commissioner for lab services Ministry of health Dr. Suzan Nabadda said that antimicrobial resistance occurs when micro-organisms become resistant and it’s a big crisis locally and globally. The Chair of National Antimicrobial Resistancesubcommitteee, Dr. Henry Kajumbula revealed that according to WHO, projections conducted in 2017, indicates that resistance is up to 7000 deaths per year. HIV in 2017 claimed 940,000 people globally. Diahorrea killed 1.7m people world wide too while cancer 8.2 globally. Dr. Kajumbula cautioned farmers against using antibiotics in the grwoth of animals instead should utilise the services of veteniary doctors. He added that its also projected that by 2030 antimicrobial resistance will kill about 10m people per year and attributed it deaths caused by road accidents, cancer among others. By 2050, 10m people will die as a result of antibiotics resistance if the problem is not prevented. “If antimicrobial is not minimised, treatment costs will go up, its also estimated that by 2030 if the problem escalates, 24m people will be driven into poverty globally,” Kajumbula said. According to Kajumbula, health workers are using antibiotics excessively and driving resistance yet in some instances, its not needed. The problem of resistance is more in ugandan than in other countries. WHO on realising the problem is huge, it developed a global action plan against microbial resistance and tasked each country to come up with a plan to tackle it.